Mentoring is a development process that seems simple but in reality is more complex than at first thought. At Mentoring Mastery you’ll be able to get a better understanding of the role of the mentor and become a better mentor through education and learning. If you are a person being mentored we’ll also give you some valuable tips on making the mentoring process a great opportunity. Our website is under construction. 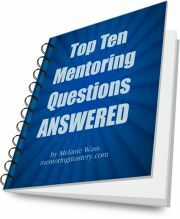 In the meantime, accept a copy of the Top 10 Mentoring Questions Answered delivered to your inbox. It’s a 40 Page Report. Just enter your main address. Copyright mentoringmastery.com All rights reserved.